Little Missouri mountain bike trail. This trail provides many glimpses of the spectacular Little Missouri River, which is known for its scenic beauty. Cascading waterfalls, stately hardwoods, old-growth pine stands, wildlife, and seasonal leaf colors are just a few of the natural delights awaiting hikers and bikers. The Little Missouri River has been designated a Wild and Scenic river. The area where Raven Branch flows into the Little Missouri, known as Winding Stairs, features breathtaking vies of the forest, river, and large novaculite rock outcrops. Albert Pike Recreation Area, Little Missouri Falls recreation Area, Caney Creek Wildlife Management Area. Little Missouri Recreation Area, Albert Pike recreation Area, Forest Service Road 25 or 106. 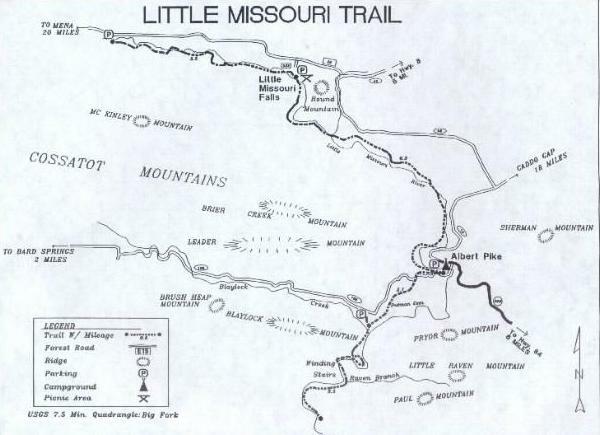 The Little Missouri Trail is 15.4 miles of single track running between the Albert Pike Recreation Area, and through and beyond the beautiful Little Missouri Falls. No big hills, and lots of creek crossings, makes it a lot of fun, for novice to experienced riders. It is worth the drive just to see the beautiful Little Missouri Falls. Crystal Clear water from the Little Missouri River head waters cascade over the rocky shoals, making excellent pools for cooling off in the clear water. Now add an excellent trail and you have a perfect day. A little over a 2 hour ride for the intermediate rider one way.